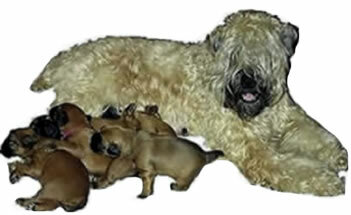 Wheaten Health Initiative was formed on 16 February 2003, with founder members who had many years experience of owning, breeding and showing Wheatens. A number had also served as committee members and officers with the SCWT Club of GB. A name, aim, objectives and a Mission Statement that reflected mutual values were set, with agreement that WHI would be an autonomous health group working independently from other organisations or clubs. Our sole aim is caring for the health and well being of the Soft-Coated Wheaten Terrier. With the involvement of worldwide ancestry within the breed, we also considered that there should be easy access to all health developments. Information and education are our principal objectives to keep breeders, owners and the veterinary professionals up to date with the latest research and testing procedures. Our Logo is designed to demonstrate the fact that the health of this beautiful breed is, literally, in the hands of us all, owners and breeders alike, and to depict our vision of global co-operation. The onus is on all Wheaten Terrier owners and breeders to build up knowledge of the ancestry of their dogs and to understand the health issues and Health Tests as they are developed. In owning a Wheaten, you take on not just a dog, but a shared responsibility for the future of the breed. "Their health really is in the hands of us all"
A comprehensive web site launched, covering many aspects of Wheaten health. Links established with American key researchers; Dr Meryl Littman, VDM, DACVIM, Associate Professor of Medicine University of Pennsylvania, School of Veterinary Medicine and Dr Shelly Vaden DVM, PhD Diplomate ACVIM, Professor, Internal Medicine, North Carolina State University, College of Veterinary Medicine. First Newsletter published (over twenty editions are now available on our Web site). Three members of WHI attended the ‘Keystone Health Conference’ in Colorado USA. This was a three day conference, dedicated to Wheaten health. The main speakers were Dr Meryl Littman, Dr Shelly Vaden and Dr Paula Henthorn, Geneticist (also at Pennsylvania School of Veterinary Medicine). Anna Marzolino demonstrated the ‘Health Tracker’, which allows owners to input blood and urine test results to monitor their dogs’ health. Dr Littman and Dr Wendy Beers (a Vet and Wheaten breeder), produced descriptions of each test category giving indications of what results outside of the ‘Normal Range’ could mean (see Health Tracker). Also, Dr Wendy Beers DVM, instructed WHI attendees on the use of a refractometer to carry out the Heska ERD-HealthScreen™ Canine Urine Test. This urine test can indicate protein loss at an early stage, and the refractometer (a type of hand held microscope), is used for measuring urine specific gravity (USG). Following the Conference, WHI took the decision to raise awareness of the above test which had recently become available to Vets in the UK. An ‘Information Pack’ was produced and a number of testing sessions arranged. This resulted in one Wheaten giving a positive indication of losing protein where previously no signs of ill health were evident. A vet consultation confirmed a diagnosis of PLN, and sadly, the dog died within six months of the diagnosis. Dr Jeff Sampson, Canine Genetics Coordinator at the Kennel Club, helped WHI to establish links with the British Small Animal Veterinary Association and subsequently WHI produced a ‘Comparison Chart for Hereditary Diseases’, for the BSAVA Web site to raise awareness for the Veterinary profession. In October WHI held its first Seminar on Protein Losing Diseases entitled; “The Health Notebook and Beyond ...”. This was presented by Janet Petros, past Health Chair of the SCWT Club of America. Also attending were three other American visitors; Jim and Roni Andrews demonstrated their pedigree database and Kathy Clarke who, like Janet had first hand experience of breeding and owning Wheatens that have died of Protein Losing diseases. Roni Andrews compiled a ‘Medical Terms’ document for WHI, which was published and made available on our web site (later incorporated in our Wheaten Health Handbook). WHI held an on-line ‘Silent Auction’ to raise funds for our programme of health education. Initial contacts were made with professionals at the Animal Health Trust (AHT); Dr Ken Smith BVM&S, PhD, FRAPath, MRCVS, Pathology Manager, Dr Cathryn Mellersh, BSc, PhD, Senior Canine Geneticist, and Sue Cade, Diagnostic Services Manager. This resulted in two steering group members holding preliminary talks to involve the AHT in investigating the diseases that affect the breed. July - a donation of $530 (£300) was sent to Dr Littman in America (see note in 2003), for the 'Informative Families Study' which sets out to investigate the diseases that affect our breed. In February WHI, with the help and guidance of the AHT, set up standardised Breed Specific Protocols for testing Wheatens for the hereditary diseases that affect the breed. Dr Cathryn Mellersh and Dr Karin Allenspach, med vet. FVH Dipl, ECVIM-CA,PhD,FHEA, MRCVS, Senior Lecturer Small Animal Internal Medicine, at the Royal Veterinary College (RVC), agreed to present a Seminar for WHI. The ‘Towards a Brighter Future’ Seminar was held in November; Dr Mellersh spoke on basic genetics, DNA, genes, and how mutations cause inherited diseases and Dr Allenspach, who had in the past worked with the American Key Researchers, talked about Protein Losing Diseases in the SCWT. Also at this seminar Dr Allenspach mentioned the pANCA test which she had previously used in America when working with Dr Vaden, and the possibility of setting up a Research Project in the UK to validate it. The first two sections of the “Wheaten Health Handbook” were available at this Seminar; this publication now also incorporates ‘Medical Terms’. A UK Genetic Research Fund was established by WHI. WHI continued to communicate with both Dr Allenspach and Dr Mellersh, encouraging their co-operation in the development of the pANCA Research Project, which would also include the storage of DNA at the AHT for future research. A further ‘Silent Auction’ was organised to raise funds to support the work of WHI. A meeting was held between WHI and the SCWT Club of GB committee in March, where Lynn Carter, on behalf of WHI, identified the pANCA Project as an area of work that could be carried out by both organisations, as a co-operative venture. More health topics for the Wheaten Health Handbook were added to the publication and the Web site. In June, five steering group members attended an Open Forum held by the British and Irish Breeds Preservation Trust, the speakers were Dr Jeff Sampson, Maud Hawkes, Skye Terrier owner and an expert in the field of endangered breeds, Paul Keevil the KC Vulnerable Breeds Committee and Lynn Carter, representing WHI. WHI pledged a series of three donations to the AHT, the final donation was sent in December 2006. In October, under the umbrella of the British and Irish Breeds Preservation Trust, WHI was invited to attend the British Veterinary Nurses Association Congress where copies of the ‘Comparison Chart for Hereditary Diseases’ were distributed. In February a seminar ‘Healthy Dogs – Naturally’ took place. Speakers were Marie Miller, a Tellington ‘T’ Touch practitioner, and Phillippa Rodale, a vet with additional qualifications in Homeopathy. The seminar also held 5 workshops: Tellington ‘T’ Touch; Homeopathy; Stress Free Living With Your Dog; Natural Raw Diet and The Use of a Pedigree Database. Dr Allenspach contacted WHI with the news that she had received funding for scientific research to validate the pANCA test, and asked us for assistance in arranging testing sessions etc. WHI informed the Club of GB which agreed, in principle, to co-operate with this research project. In April, a meeting was held at the RVC, with Dr Allenspach, WHI members, Lynn Carter and Carole Barnes-Davis and Judy Creswick, SCWT Club Secretary. Newsletter 14 announced this new project. In June a ‘pilot’ pANCA sampling session took place at Weedon Bec. Four further sessions, arranged and facilitated by WHI, were held at the SCWT Club of GB Fun Day South, Weedon Bec, Chesterfield and Highworth. As a result of the initial findings, Dr Allenspach was able to proceed with the project and owners were approached to participate in a ‘Longitudinal Study’ This would be a mammoth undertaking, with dogs and owners attending sampling sessions every six months in Northamptonshire or Wiltshire, or by testing via their own Veterinarians. The KC Charitable Trust awarded a grant of £600 to WHI, to help with the cost of the sampling sessions. WHI organised the first two pANCA Longitudinal Study sampling sessions. ‘The Care and Well being of your Dogs’ Seminar was held in May with Dr Allenspach talking on Digestive Disorders in Dogs and the possible causes, and Nicole Mackie, a Canine Therapist, discussing Stress in Dogs. A radical redesign of the WHI Web site was undertaken to provide more structured navigation of Wheaten health matters and an overview of the pANCA Research Project. WHI organised a further two pANCA Longitudinal Study sampling sessions. WHI organised the next two sampling sessions for the pANCA Longitudinal Study with the final one taking place in July. A WHI Seminar was held in September to enable Dr Allenspach and her team to report the findings of the pANCA Project to the Wheaten fraternity. Project Findings:” see final report for Dr Allenspach's assessment of the pANCA study period. The pANCA Project raised awareness of Protein Losing Diseases amongst Vets who, through the project, now understand more about the hereditary diseases that can affect Wheatens. A wealth of clinical and pedigree information for the breed has been collected on both healthy and affected dogs. This project could consequently form the basis for further genetic studies of SCWTs in the UK. Owners of the dogs who took part in the Longitudinal Research Project continue to report to Dr Allenspach on the health of their dogs, completing a twice yearly questionnaire, available via the WHI Web site. In this way the Project continues, and may, in the future, reveal more information. WHI continues to facilitate the reporting of breed health to Dr Allenspach and her team. A collaboration of the AHT and RVC for possible future work regarding DNA was established. An on-line ‘Silent Auction’ was held; many wonderful items were donated by supporters, and the ‘star prize’ was a beautiful hand made patchwork quilt donated by Wheaten owner Ann Ryan. In March WHI received notification from “Dogs Today” Magazine of an article in their April publication, called, “Measure of Success”. The article gives recognition to WHI’s work and has, along with the Dachshund Club, been awarded ‘top honours’ for their approach to health. This index was reviewed in late August to early September 2011. The report can be viewed on the Karlton Index site. Wheaten Health Matters - a Facebook group for Wheaten enthusiasts was started on 23 August by Sandra Jeffries in UK and Anna Marzolino in US. Just 3 days later the group had over 300 members. The experience of long standing Wheaten owners, including all the present WHI steering group, can complement and help others who may have a health question or problem and also discuss the many facets of the breed and it's ancestry. Go to and login if you are already a member but, if not, you can sign up. In October, the Soft Coated Wheaten Terrier Club of America announced that the National Institutes of Health (NIH) would be able to map the Wheaten genome. Helen Moreland (SCWTCA) reported: "We have a chance for the NIH to look at all the health diseases of the SCWT, by DNA mapping the genome and identifying disease markers. To do this we need samples of blood from dogs born between 1 January 2006 and 31 December 2010"
WHI immediately set up a Wheaten Genome and Lifetime Study web page with summary details and, through its' portfolio of Facebook and email group channels, disseminated this message. The result was email requests to NIH (via the WHI web page) for testing kits and participation from many Wheaten owners in UK, Germany, Taiwan, Australia, New Zealand and USA. A Seminar, 'Breed the Perfect Puppy' with Gwen Bailey, renowned author of many canine behavioural books and Prof. Jeff Sampson, giving his last talk as Genetics Consultant at the Kennel Club, was held on Saturday 4 February 2012, at Weedon Bec, Northamptonshire. With a full house and an appreciative audience, feedback was overwhelmingly positive. See Seminar 2012 for a 'taster' of the day. For more comprehensive speakers reports go to Newsletter 22. A donation of £532.90, (just over $800 USD) was made on May 15 by WHI to Drs Meryl Littman and Paula Henthorn, of the University of Pennsylvania School of Veterinary Medicine. This in support and recognition of their recent research into genetic testing for PLN-Variant Genes in Wheaten Terriers. (see also PLN page for more detail and Dr Littman's reply). In support of the PLN Research project, WHI fully distributed 300 cheek swabs which were paid for and shipped from America. A new web page also provided up to the minute instructions and gave details of the project's progress. Drs Littman and Henthorne was pleased that the target of 1000 returned swabs was reached by mid-October, some time before the expected date. More information on the PLN page. Grooming and trimming the Wheaten coat can be a challenging task and if not properly carried out can, at worst, cause behavioural and skin problems. The task should be an enjoyable experience for owner and dog and should be learnt (by both) from bringing home a puppy. With much preparation and care, videos of a puppy and adult dogs being trimmed have been produced and can be viewed in full screen from our grooming page. The 'Puppies' web page has also been further reinforced with a page on Puppy Care and Grooming, covering these important aspects of a dog's healthy development. The Midland Counties Canine Society and Dog World Website competition was judged recently and, although the WHI did not strictly meet Breed Club criteria, they decided that this site merited a 'special award'. ...."I am delighted to tell you that the judges were especially impressed by the SCWT Health Initiative Web Site and so awarded a special prize. This will be presented at Midland Counties on Thursday 25 October". and the (very welcome) £50 award was collected on that date by representatives, past and present, of our group. In early November an eye problem, microphthalmia, not commonly heard of in Wheaten Terriers was discussed on Wheaten Health Matters (see second para. 2011). This seemed to occur only in some countries and further details were obtained with contact to the Finnish Wheaten Club. Details are now available on our existing eye page. Dr Karen Allenspach (Royal Veterinary College) confirmed that the longitudinal study for the pANCA Research programme has provided sufficient data to complete this Study. The March Questionnaire will therefore be the final one that participants need to complete. Dr Allenspach and her Team at the RVC, Wheaten Health Initiative and the SCWT Club of GB, offer thanks all the owners and their Wheatens who have supported the project. Data analysis will follow. The Facebook group; Wheaten Health Matters, has grown to a membership of over 1,000. Go to to find out more. Twitter account launched 8 July @wheatenhealth This provides a very useful connection for following all associated canine issues, informing followers of important Wheaten health issues and notifying other relevant information. From the launch in September 2012, the grooming videos have attracted over 12,000 views from Wheaten owners in 50 different countries. Most popular is the Puppy trim 4,300 views, show trim over 4,200, adult trim 1,900 and trimming with clippers at 1,600. The top viewing countries are UK, USA, Canada, Germany and Australia, closely followed by Norway, Sweden, Netherlands and Czech Republic. The launch of the video 'How to comb your Wheaten' attracted the largest number of hits seen on the WHI website. Facebook site Wheaten health Matters and others were used to announce the release and the news was soon shared with owners around the world. Home page revised to give easier navigation for mobile visitors. Visitor count exceeds 70,000 and daily count increases steadily. Congratulations also to Wheaten Health Matters whose membership now approaches 3,000. Visitors to the WHI website exceeded 100,000 in December this year. Congratulations to Wheaten Health Matters Facebook group who are now approaching a wonderful, worldwide 4,000 members. "Welcome to Give a Dog a Genome, a new initiative launched by the Kennel Club Genetics Centre at the AHT to create the UK’s largest canine genome bank to help generations of dogs. This genome bank will improve dog health by radically increasing our understanding of the canine genome. We aim to sequence the entire genomes (all 2.4 billion letters of DNA) of 50 different dog breeds by the end of 2016, but we need your help to do so. Click here to read the latest news update. WHI announced:"Having made a donation of £500 to the SCWT Club of GB to be matched with the Club's similar contribution towards genetic sequencing of one SCWT, we intend to use the remainder of the fund, which stands at £2,000 to enable another Wheaten to be sequenced." "the WHI Steering Group have considered and agreed that a donation of $700 (£556.81) should be made to the SCWTCA Endowment Fund Inc. The group feel that the money should be divided equally between the PLE Research Project and the annual maintenance costs of the Wheaten Health Database"
On a related subject, the membership of the Facebook Group, Wheaten Health Matters now stands at 7,765. To continue to provide support, education and information about health matters affecting Wheatens. WHI continues to update and improve the Web site as new information becomes available. WHI will continue to look for novel and appropriate ways to communicate with owners, using all possible media networks to achieve this. WHI appropriate Web site content are produced with the help and guidance of the AHT, Dr Karin Allenspach, appropriate Veterinarian specialists and the SCWT Club of America. We couldn't have got this far without your help.